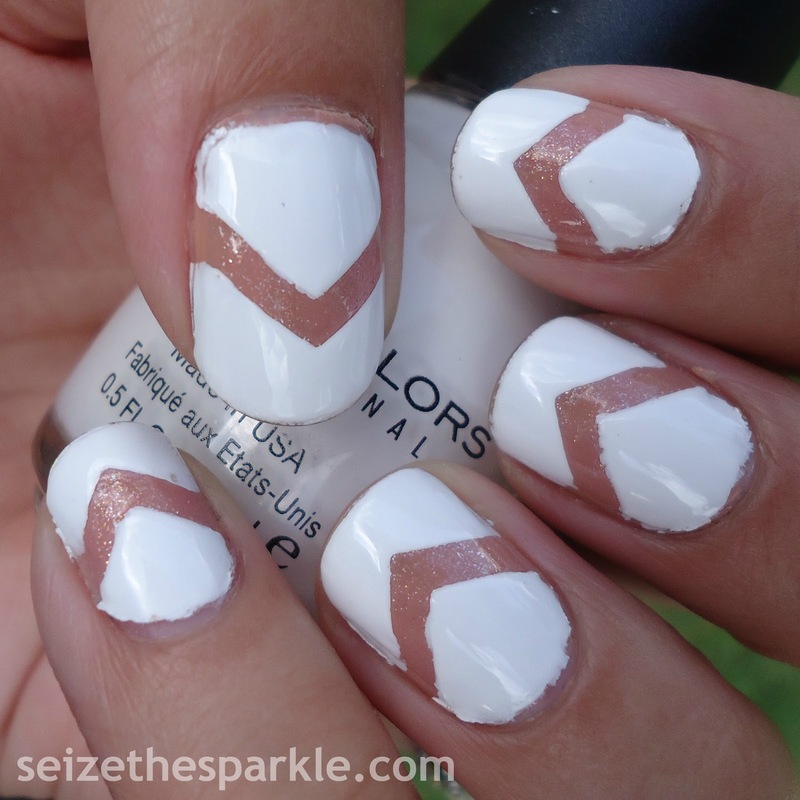 When I took off my negative space nails, I thought about using the same base for my PATTERN nails. I decided that I was in the mood for something a little bit more pink, so I chose Soul Mate from SinfulColors. It's a great mid-toned coral leaning rose pink, a gorgeous shade on any skin tone! 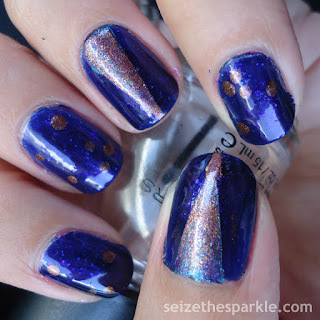 I resisted the urge to use gold for this stamping and chose Sally Hansen Pacific Blue. 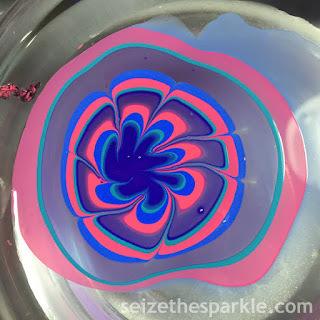 It did so well in my Water Marble that I figured it would stamp well, too. No complaints at all, but there was definitely a little bit of user error while rolling the stamper. Some patterns show that more than others, and with this one, it's really noticeable! I could definitely use a little more practice, and probably an upgrade in plates and stampers! I've been eyeing up the Secret Garden collection from Bundlemonster for a while, now! When it comes to this prompt, I kind of feel like anything goes! I mean, there's always solid trends for the season and everything, but lately, it seems like there are more designers really pushing the envelope and creating something totally bold and different. One day I will learn how to make white nail polish look ah-mazingly clean on my nails. This is one of those times when my nails looked really great in person, but as I'm looking at the photos... Eh. Not exactly thrilled. I was so excited to be able to finally do Negative Space, too! I chose Private Viewing as my base coat because it was sheer and decently close to my skin tone. In hindsight, I probably could've used 2% Milk or OPI Bubble Bath. Both are sheer and a lot less pink than Private Viewing. But I needed to cover the yellow, so I turned to something a little bit more opaque. Rather than leave it looking like a natural nail, I added a hint of shimmer with SinfulColors Pink Glass. 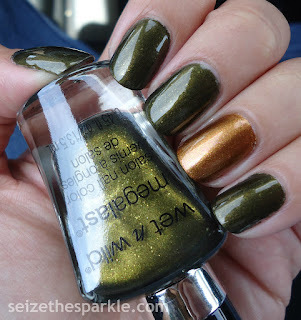 I didn't take pictures, but those two polishes looked really cute layered together. To create the negative space, I used chevron nail vinyls. 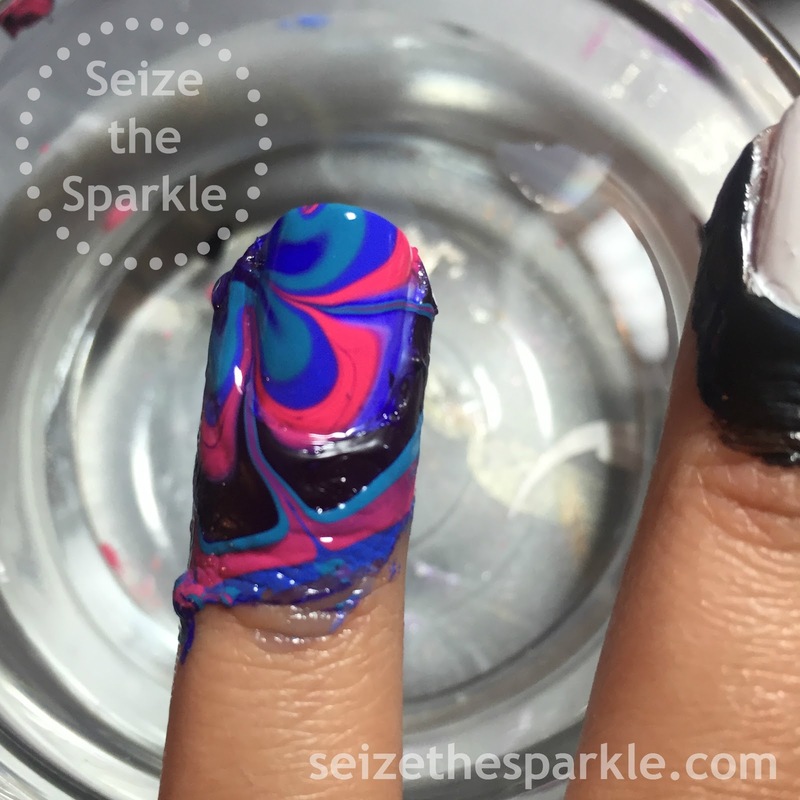 It took a little while to get them on all my nails, so if you're going to give this a try, make sure you've got a decent amount of time set aside! I wanted to be extra sure that the dip of the chevron was centered, and that the negative space was consistent across all of my nails. When my guides were all good to go, I painted 2 coats of Snow Me White. At that point, I still had streaking, so I added a coat of Mattely in Love in an attempt to smooth things out. I followed that up with a third coat of Snow Me White. Using tweezers, I carefully removed the guide after the 3rd coat on each nail. I waited about 10 minutes and sealed everything up with a generous coat of Seche Vite. 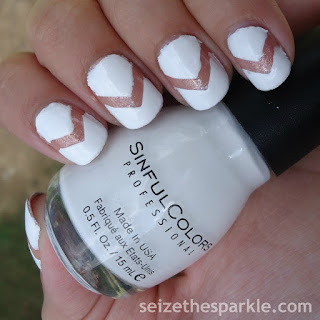 I wouldn't mind trying another Negative Space mani, but I think I'll try it in another shade. 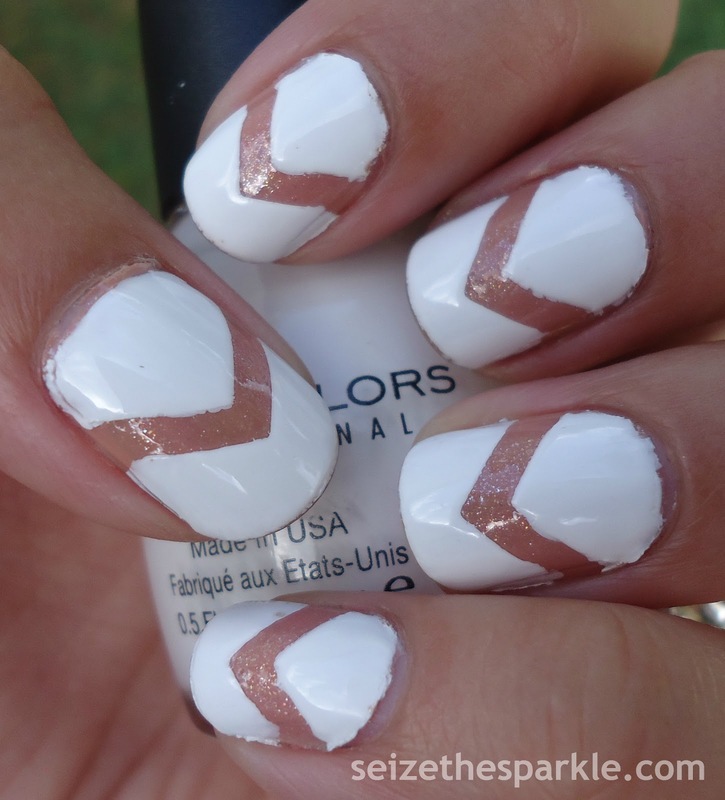 Don't get me wrong, white definitely catches the eye, but it's probably the least forgiving shade around the cuticles. 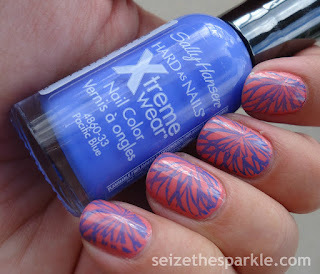 Like I said, I'm not the biggest fan of the pictures, but I did love wearing this mani! Reading has always been one of my favorite things to do. There's nothing better than getting absolutely lost in the universe of a good book! I love how a great story can pull you from wherever you happen to be and drop you in a fantastic, exciting place where anything can happen! Then there's that little thrill everytime you reach for the book, followed by that little bit of sadness when you finish the last page. I've got a lot of favorite books and authors, but the most recent series to lure me in? The Caster Chronicles by Kami Garcia and Margaret Stohl. The series is set in Gatlin, South Carolina, a town that's a hotbed for paranormal activity. It's not a real southern town, but you would never know it. Anyone who has visited the Southern States will nod their head as the scene is set in the small town. Dar-ee Keen, Link's Baptist Mama, Bottle Trees, Amma... the list goes on and on. Don't even get me started on how you can feel the searing humidity and smell the lemongrass and mint! I could rave about this book all day, but we're here to talk about nails, so I'll cut to the chase. The Caster Chronicles tell the story of Light Casters and Dark Casters. Light Casters are good, Dark Casters are evil. When a Caster turns sixteen, they choose what type of Caster they will be. Unfortunately for Lena Duchannes, she comes from a line of cursed Casters. Rather than choosing, the sixteenth moon claims the women in the Duchannes line for Dark or Light. Lena's cousin Ridley was her best friend until she turned sixteen and went Dark. Lena is terrified that her fate will be the same. Is it just me, or are these polishes just meant for each other? I thought so! They're both bold metallics with a lot of depth. I swear, I Moss Have It gets better every time I use it, and Leggy Legend is just bright, shiny, and awesome! 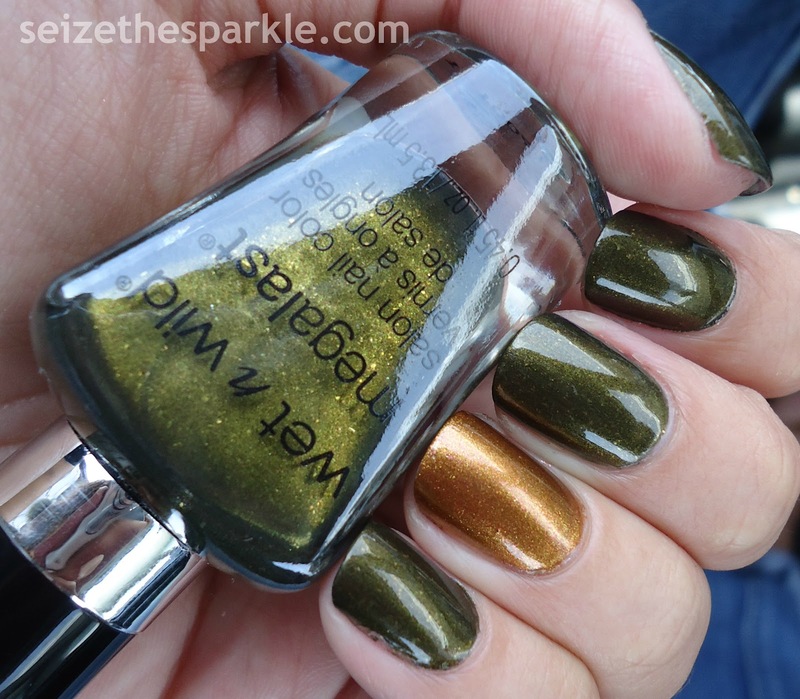 Both of these polishes have excellent formulas. And both could probably have been opaque in two coats. I went ahead with a third because it just felt right! Despite the fact that righty wasn't in the mood for a photo shoot, and the fact that my polish chipped, I still LOVE this mani. 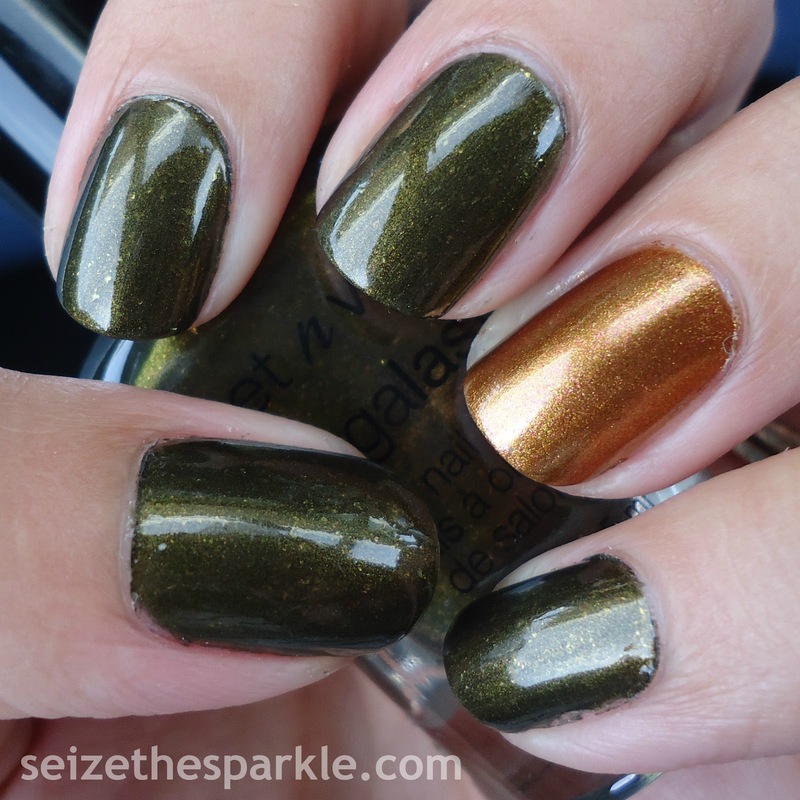 These two colors paired together are just sooooo magically Fall right now. I could definitely see pairing them again for a gradient, french tips, possibly even an Autumnal Seriotype? I can't begin to describe how insanely delighted I am that it. is. Friiiiiiiiday! It's just been enough of a crazy week that I'm ready for a little bit of relaxing this weekend. Just a little bit, though. I've definitely got plans to attack my clothing in a modified KonMari sort of way. With all the moving around in the past two years, I have clothing all over the place. It's beyond time for a big cleanup. Last week, Mr. Sparkle and I cleaned up our Pantry, and I'm loving how organized it is! It's really nice to be able to see everything you have, and that's what I'm going for in Le Boudoir. What are your weekend plans? I know it's probably another week or two until pumpkin patching is a thing around here, but maybe not in your neck of the woods? Any other Fall cleaners/organizers out there? Whatever you get up to... I hope you have a great Friday and an even greater and more fabulous weekend! And if you are cleaning out your closets like me... Good Luck!!! Rainbow Honey Just Sugar Coat It! Slushious is powered by three different slushy flavors, Grape Escape, Tangerine Twist, and Busta Lime. My neon collection is lacking a little, so I tried to pick the closest purple, orange, and green shades for my principal colors. Those polishes were SinfulColors Amethyst, SinfulColors Feel the Vibe, and SinfulColors Happy Ending. 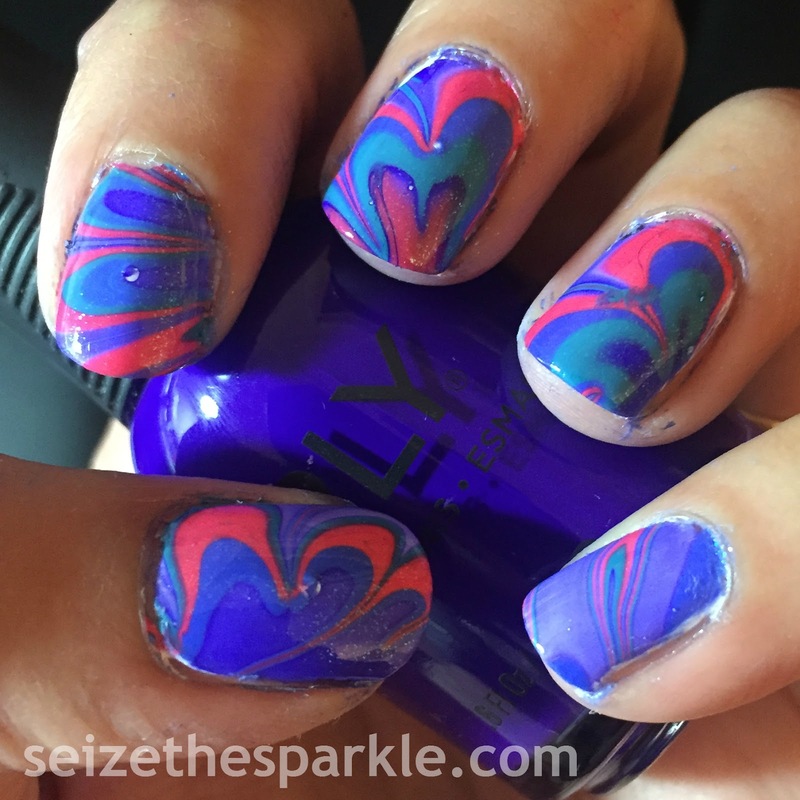 When I originally brainstormed this look, I was thinking that I'd do gradients on all of my nails. 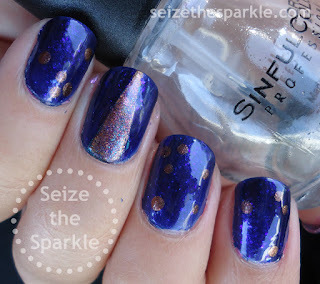 At the same time, I wanted to add a little bit of the bubbly fun of Slushious by way of shimmer and glitter. It seemed like a lot to have going on over all of my nails, so I decided on accent gradients instead. One on my left hand, two on my right. That would leave me with three skittles on my right hand and four on my left. I decided to repeat purple on my left hand, because I love purple and SinfulColors Amethyst is an almost-perfect match for Oh's shade of purple! Once I had the base colors down, it was time to paint and gradient. I think I sponged over each gradient nail five or six times before I got the opacity I was looking for with Amethyst and Feel the Vibe. I did have to dab a little Happy Ending on my tips. My VNL was a little too visible for my taste! After that, it was just a matter of adding in coordinating shimmer. For my skittles, I cut up cosmetic sponges and used those to dab coordinating shimmer polish in random patterns. For the gradients, I used the same cosmetic sponge I used for the base colors. I painted the coordinating shimmers directly on the sponge, then dabbed the polish onto my nails. Finally, I was happy with the amount of shimmer and brightness of the color. I topped everything off with a coat of Pirouette My Whistle. That was followed up with two coats of SinfulColors Clear Coat and Seche Vite for some serious shine! If you haven't seen this movie, you should definitely watch it. Whether or not you have kiddos, it's a great movie! Singer Rihanna voices Tip and Oh is voice by Actor Jim Parsons. I love him on Big Bang Theory, and he's equally great in Home! 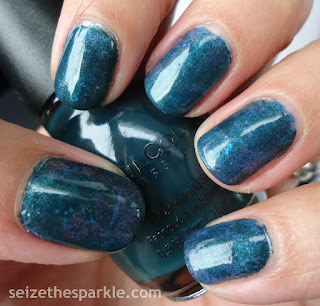 Next on the schedule... Nails Inspired by a BOOK will blend with Fishbowl Friday 047... I've got a couple of ideas in mind, but it all depends on which prompt I pull! Fishbowl Friday has been a fun wild card to throw into the mix so far. I'm hoping that trend will continue! When I like a song, I typically listen to it non-stop until I learn all the words, melodies, everything. My brain is seriously full of song lyrics. I don't really forget them once I learn them! This particular song has been on heavy rotation lately. It's been one of my faves for a while, and it's the perfect inspiration for SONG nails... Beam Me Up by Cazzette. Since the song title is Beam Me Up and mentions going "higher than a supernova," I figured tractor beams set against a nighttime sky would be appropriate. Hit the Dance Glow has been staring me down since I brought it home, and it looked like just the right amount of sparkle for my base. Two easy coats and done. Really nice formula for such a loaded shimmer polish! Next, I added one coat of Indigo Motif. It really popped over the sparkles! I looooove how it glows!!! I topped everything with a coat of Seche Vite and waited for my polish to dry. 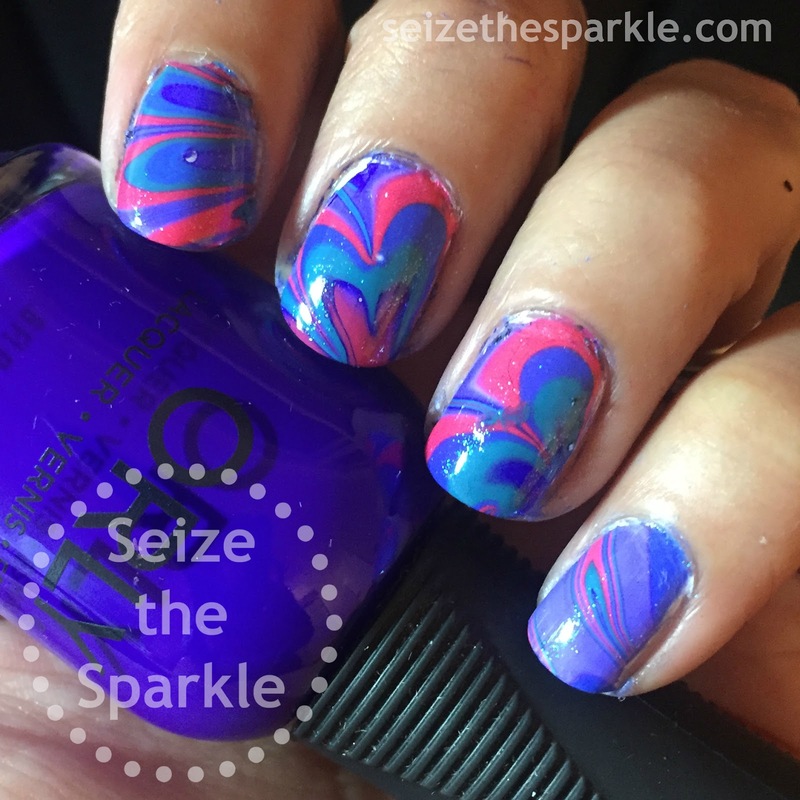 After about 10 minutes, I applied skinny nail vinyls in an upside-down V on my left ring and thumb fingers, and on my right pointer and pinky fingers. Commence tractor beams! I dabbed on a coat of Deviantly Daring, but that was a bit too green. So, I tried to mute it down with KBShimmer Pigment Of My Imagination. That worked a little too well, so I needed to add contrast. Oh, Baby from Pure Ice wasn't enough, Leggy Legend from Essie was a little bit too much. Finally, I mixed Pigment Of My Imagination with Leggy Legend and got a fun rusty colored sparkle that I dabbed on with a sponge, creating my beams. Then, I removed the vinyl guides from my nails. As my tractor beams dried, I noticed that my other nails seemed a little sparse in comparison. I added random dots around the edges of my nails. I'll let you decide if they're constellations or some sort of alien code! My tractor beams were nice and dry by the time I was done dotting, so I hit those nails with a thick coat of Seche Vite. After waiting about 10 minutes for my dots to set up, I added Seche Vite to my remaining nails and called it a night. 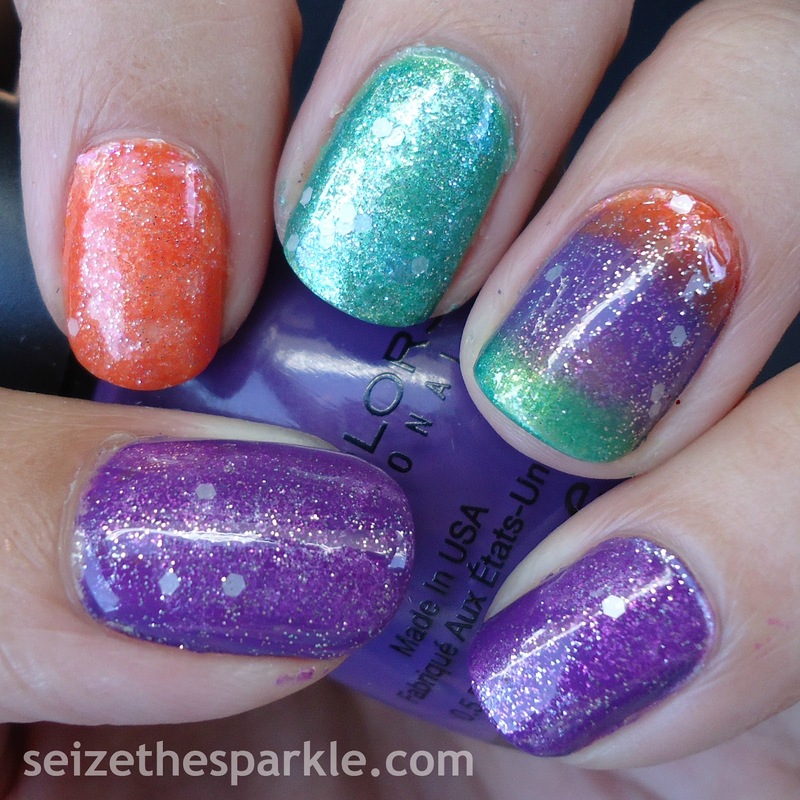 It's not often that I come across polishes in shades that I don't already have in my sparklestash. But this one... it's definitely unique. It's a gorgeous purple shade that's not a mid-tone, but it's not dark either. A mid-dark tone? Honestly, when I was wearing it, there was a brightness to it that was a little surprising. It's a great shade, and while it might be sorightnow because of the Pantone status and everything... I'm pretty sure that it's core SinfulColors. Easy to find and affordable! Application was great. Same wonderful formula that I expect from SinfulColors! I probably could've used two coats, but I didn't remember to wrap my edges on the 2nd coat. Boo... I felt like I was really turning a corner with that! You might notice a little bit of cuticle flooding in the photos, but that was all user error on my part. 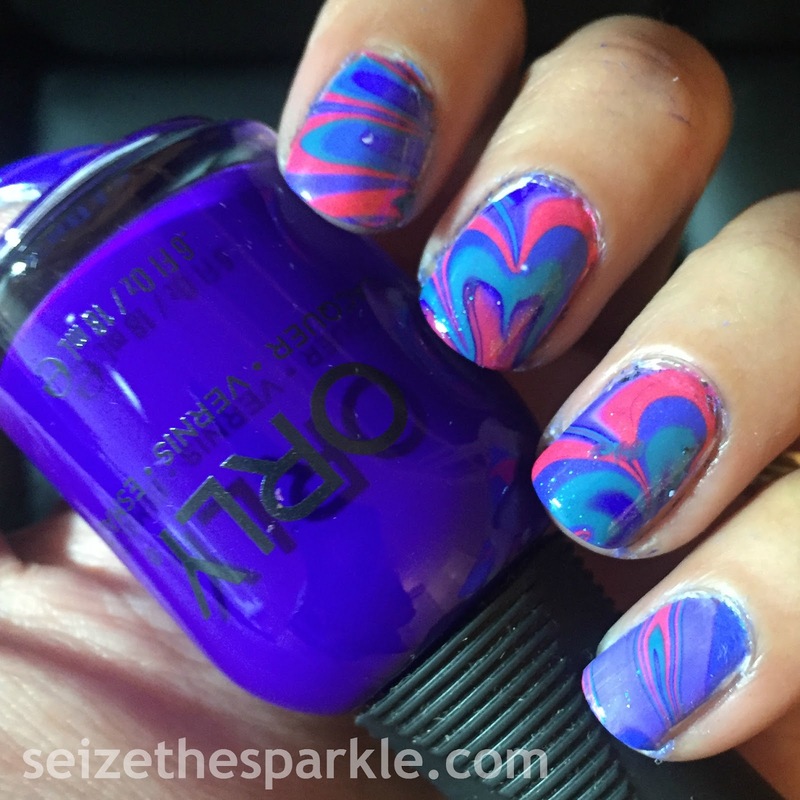 I was a little tired after watermarbling, and I'm definitely not used to painting more than one mani per night! 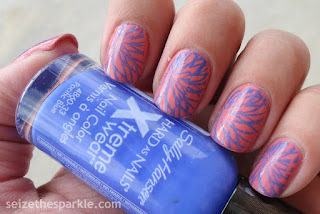 This is another one of those shades that I didn't really want to take off... but the challenge presses on! I'm not too far behind, and I'm hoping to catch up this weekend. Of course, that's only if my Fall cleaning goes according to plan! Hey guys! Guess what?!? I fought the WATER MARBLE and I WON! Can we just stop for a moment and appreciate the fact that I actually managed to WATER MARBLE not just one, not two, not three, not four nails, but all five nails on my left hand? That was enough of a miracle on its own, so I couldn't really risk it by trying out the technique on my right hand! Sorry, I am nawt sorry!!! When I sat down to paint this mani last night, I was fully ready to spend a lot more time on it. 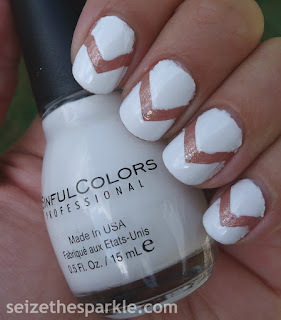 Thankfully, I didn't have to, and that's because of this fabulous tutorial from Hanna Rox Nails. Something about the way she explained the process definitely clicked last night. Using her tips, I was able to correct some things I didn't even know I was doing wrong! If you're struggling, her video really might help. After watching the video, I felt a little bit better about my last failed attempt. Last year's WATER MARBLE (which shall not be linked) had a lot of flaws. Like I said... I was doing everything wrong and I really had no idea! 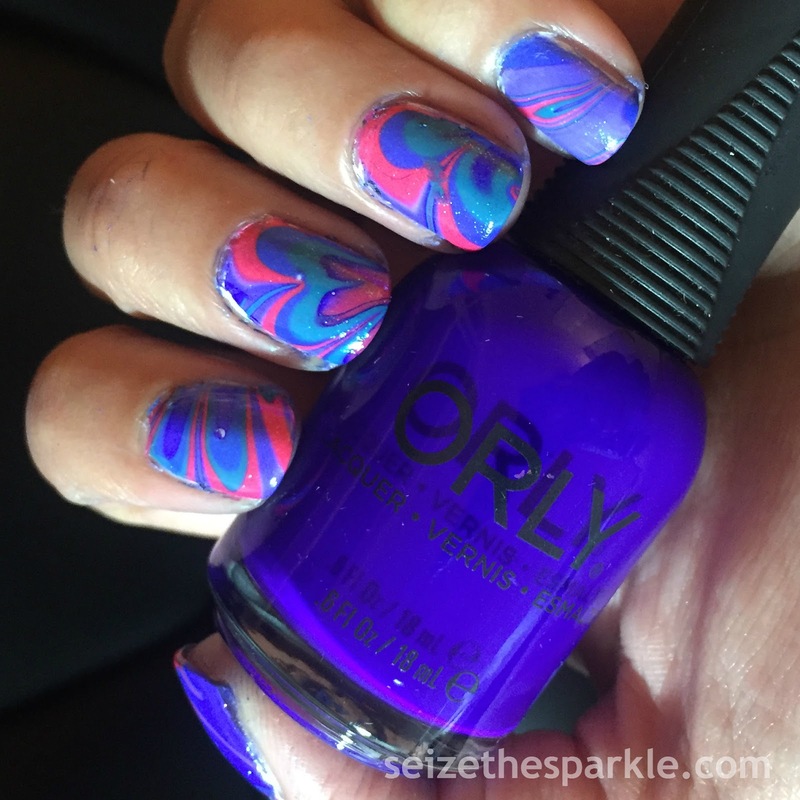 Plus, it doesn't help that there's all this animosity around water marbling. It's scary and intimidating before you even try it! I picked it up from Sally Beauty ages ago, and it's been sitting on my nail desk unopened ever since! It's waaaay cheaper than a lot of the other options out there, and the stuff seriously works. Also, I noticed while grabbing the above image, Proclaim makes a white version. I'm not sure if that dries clear, but I'm intrigued enough to give it a try. The dark version is an almost-black charcoal color when it dries. I used a nail brush to apply mine, but I definitely understand why some girls prefer it in a nail polish bottle. Familiar territory and all that! I was ECSTATIC, y'all. 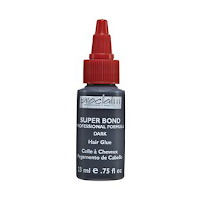 The black stuff on my nails is that Proclaim Super Bond Dark Hair Glue that I was going on and on about. 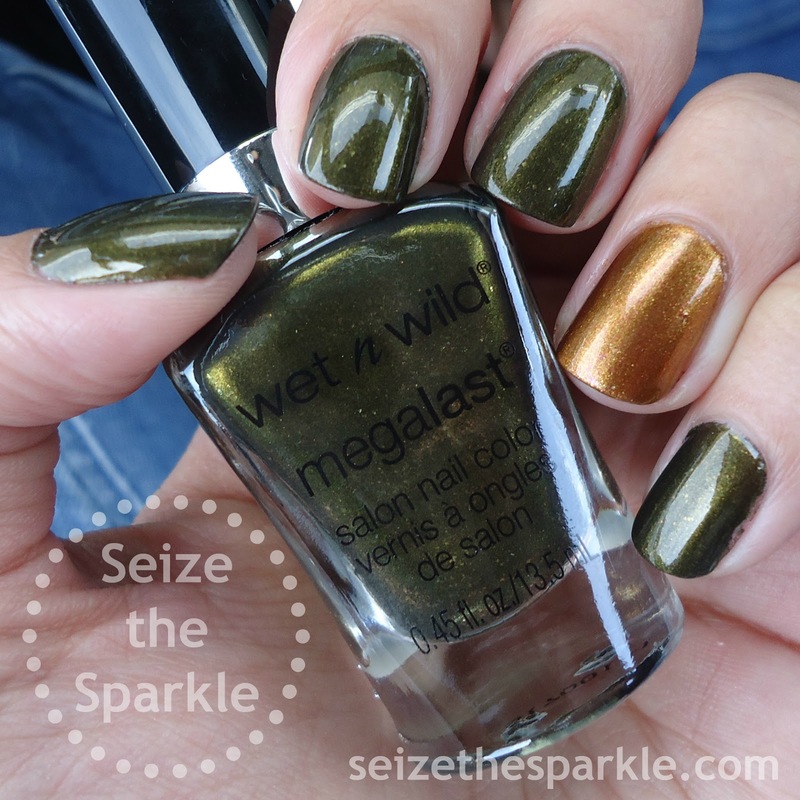 I'm so excited to try it with a Seriotype or Gradient mani! After waiting about 30 seconds, I used tweezers to pull the latex off my fingers. It pulled off cleanly in one swoop! In hindsight, I would definitely paint the latex down further. At least to the bottom of that top knuckle, if not further! Once I had one nail done, I repeated the same steps for each nail. I cleaned up the excess polish on the fronts of my fingers before adding a coat of Oh, Baby by Pure Ice. I'm not sure that I really needed to give the marbling that much time to dry, but I didn't really want to smudge it all over the place! Next, I used a coat of Seche Vite to top everything off. Then, I cleaned up as best as I could. Truthfully, my immediate cleanup skills need a lot of work. Typically, I go to bed right after I polish and worry about cleanup in the AM. Also, I usually wear every mani that I paint on my nails (both hands!) for at least one full day. I was such a mess at the end of painting my left hand that I just couldn't see how painting the right hand was going to work out. And then there's the fact that while I was happy with the way this turned out, it just wasn't meant to see the light of day. Again... sorry, not sorry! Remember how I wasn't sure exactly how long this whole thing was going to take? It took about 45 minutes from setup until I was ready to photograph. I know that's just for one hand, but I feel like that's not bad! All in all, my experience with water marbling was way better this year. I definitely improved my technique and cut down on clean up time a little bit. That being said, I wouldn't start expecting another WATER MARBLE anytime soon! It's just a messy process and I really don't enjoy doing it or cleaning up after it! Give me a Seriotype or Jelly Glitter Sandwich aaaaaany day of the week! For a couple of days now, I've had the idea of dark green GALAXIES in my mind. I feel like blue, purple, and black have been done so many times before. Why not green? 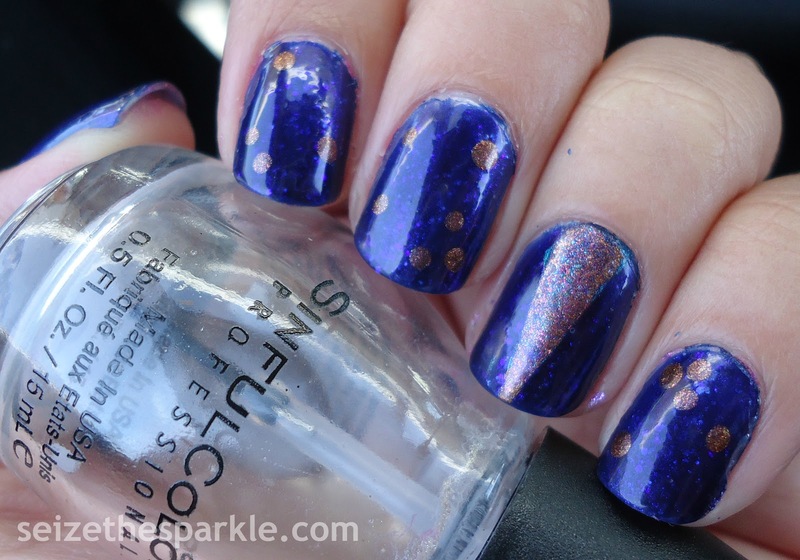 Also, I have been wanting to do an exclusive SinfulColors Seriotype/Galaxy mani for some time. 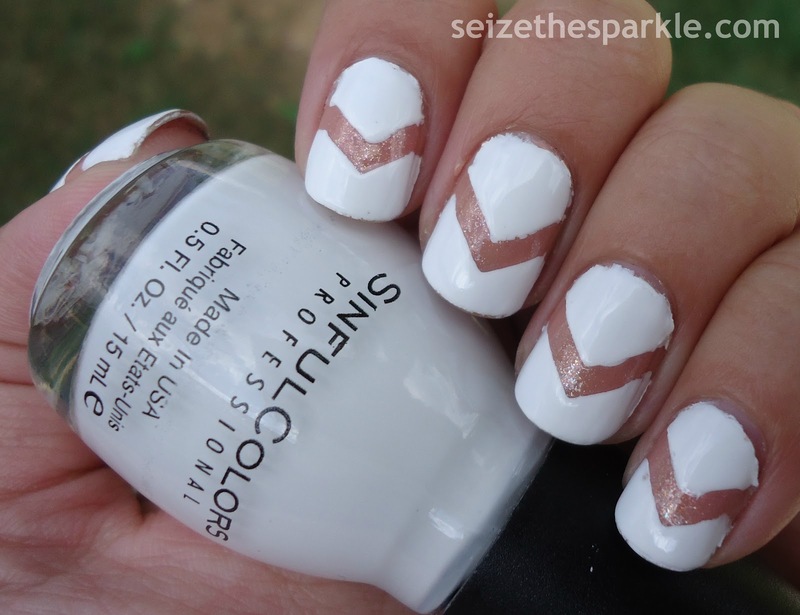 Mainly to show that it's totally possible to do cool nail art and elaborate layerings on a budget! I used Glass Pink as a base for my nails. I've never used Calypso before, so I don't know if it's a stainer. But polishes this color tend to do that, regardless of what brand they are! Two coats of Calypso followed, giving me a nice dark teal base. Using cosmetic sponges that I had cut up into smaller squares, I dabbed Dream On, Blue La La, Snow White, Cream Pink, Let Me Go, and Calypso over my nails. When I was happy with the level of colors, I added some small dabs of Teal Midnight to add a little sparkle. Two coats of Clear Coat melded all my colors together nicely, and a coat of Seche Vite set everything into place. In hindsight, I probably should've started with Snow Me White over Calypso, rather than Dream On. 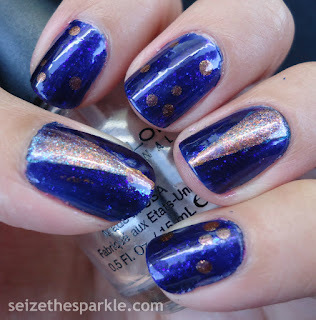 It's been so long since I did a proper galaxy manicure that I sort of forgot how to build one! This layering definitely leans more towards a Seriotype than a proper Galaxy manicure. I really like how it turned out. Bonus points for the fact that Calypso is practically a dead-on dupe for Pantone Reflecting Pond. It definitely takes me back to the early 90's era of mini back-packs, that's for sure!